The roles and responsibilities of the KLC Speech-Language Pathologist (SLP) change markedly over the course of a student’s educational experience. In the earliest years of programming, services are geared almost entirely to developmental and age normed goals and objectives with the intention of advancing a child’s articulation, fluency, language acquisition and basic comprehension as well as addressing such challenges as swallowing. In later years, the focus of the SLP is much more functional in nature as the student, family and team address his/her ability to improve the functionality of communication and enhance opportunities for social and vocational engagement. Every educational curriculum is inherently language-based and so the ability of the SLP to understand and program for each student’s unique language comprehension and expression characteristics make a substantive difference in their long-term success. The SLP works in direct collaboration with the Special Education Teacher to ensure that lessons are modified in such a way that the student has ample opportunity to actively participate in the instructional dynamic. As necessary, individualized strategies are developed for the student to improve his/her performance levels in school, at home and in the community. One specific example of where the SLP develops such an intervention is in augmentative and alternative communication (AAC), an area where the KLC SLP’s can facilitate significant gains in communication and language development. In this case, a common approach might involve the acquisition of hardware and then matching that hardware with specific software applications. 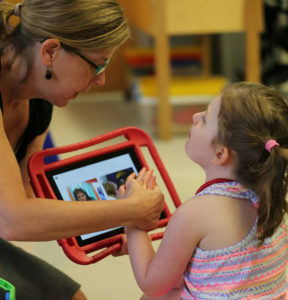 In every situation, the SLP conducts an AAC evaluation that is specific to the individual student and his/her needs.